For thousands of gardeners, amateurs and professionals alike, the coming of the warmer weather brings with it the annual scourge of crabgrass. This highly invasive weed can turn a lush, smooth emerald green lawn into a weed patch in no time if not treated promptly. Crabgrass is an annual plant, and when it dies away in the winter can leave your lawn disfigured with bare patches, ideal for cultivating the weed in the next growing season. Gardeners will call it lots of names, many of them unprintable, but essentially crabgrass comes from the family of grasses known as Digitaria. Two common varieties invade lawns, large crabgrass, which is sometimes called hairy crabgrass, and smooth crabgrass. We say invade, as it is a self-seeding plant and can produce 150,000 seeds in a season and overtake a lawn in just a couple of years if not checked. Where crabgrass differs from regular grass is that it steals moisture and valuable nutrients from the soil, making it very difficult for your lawn to get the nourishment it needs to sustain itself. A quick glance over your lawn and you may not see that there is a problem, so a closer inspection is often required. All lawns are planted with cool season grass, warm season grass, or a mixture. So every yard can be different, as the type of seed and the variety can have a huge bearing on how each individual lawn looks. Looking at the lawn, see if you can identify areas where the grass seems a little different, where the stalks are not the same shape or color. Bare patches in the lawn are also a good sign crabgrass is present, and these are particularly noticeable in the winter when it has died back. 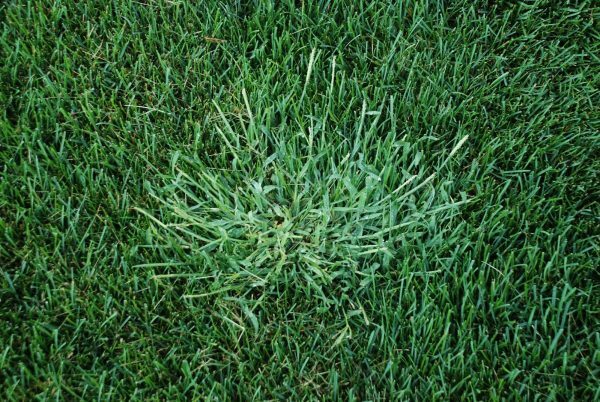 Large Crabgrass: The seedlings of large crabgrass are lighter in color than mature lawn grass, and have hairs on the upper surface of the leaves. Mature large crabgrass will have leaves that are 3 inches long and hairy, with branches that can be up to five inches long. Smooth Crabgrass: Smooth crabgrass is more common because, unlike large crabgrass, it can survive close mowing. The seedlings have light green leaves and have a smooth texture. Mature smooth crabgrass has pointy leaves which can grow up to six inches long. The issue gardeners have to face with smooth crabgrass is that even when it is cut back to less than an inch in length, it can still seed, and spread across a lawn. One of the essential elements in keeping crabgrass at bay is to ensure your lawn in tip-top condition. If the lawn grass is well rooted, sturdy, and lush, it is much harder for any crabgrass to get a hold. But if you do find that crabgrass has invaded, then there are some natural options to keep it subdued and eventually eradicated from your lawn. Pulling the young crabgrass shoots out by hand. This is best done when you first see the light green crabgrass shoots appearing on the lawn. However, you must be careful only to pick out those shoots where the seed head is still folded back to the stem. If the seed head is open, then pulling it may release thousands of seeds into the lawn and only leave you with more shoots to deal with. Let your lawn grass grow a little taller. The one thing that crabgrass really enjoys is full sunlight, so if it is shaded by your lawn grass it will never get the chance to grow. Cutting your lawn short will only allow the crabgrass to seed in areas where it gets lots of sun. Try and check the right cutting height for the particular grass variety you have in your lawn. It might be more than one type of grass, so always cut higher rather than lower. Make sure you have the right grass for your climate. If your lawn is healthy, then there is less chance crabgrass will be able to get a foothold. If you pick the right grass for your climate, then it will have more chance of generating a good root system and can fight off the crabgrass invasion. Getting your chosen lawn grass variety to grow with a regular dose of fertilizer will also reduce the chances of crabgrass seeding. Getting your lawn grass to put on a growth spurt with fertilization will put paid to crabgrass seedlings. Try watering your lawn less frequently. Rather than giving your lawn a light watering often, try to give it a good soaking every two or three days. This helps promote the grass root system, so they go deeper and are less dependent on surface water. This strong root system will make your lawn more robust against crabgrass. Crabgrass can make a lawn unsightly and cause problems; it can also affect vegetable plots and flower beds. If crabgrass gets a hold there, it can easily seed itself in your lawn with all the consequent issues. The best way to get rid of crabgrass from other parts of the garden is by hand. Yes, we know it can be backbreaking work, but if you really want to make sure the crabgrass is all gone, then doing it by hand is best. As an alternative you can pull up the crabgrass with a hoe, and can be part of your regular garden maintenance routine. Another way to make sure crabgrass does not get a foothold in the flower beds and vegetable plot is by mulching with hay or wood chips. This also helps keep the moisture content up in the soil, and gives the roots of the plants a helping hand to grow and strengthen. Going the herbicide route will stop any crabgrass seeds from germinating. Most of the popular brands are sold as crabgrass preventers. Preventing the germination of the thousands of seeds from even a young plant is one of the most effective ways to stop crabgrass from spreading. Many of the crabgrass preventers sold at the local garden center are made from corn gluten meal. This meal kills the roots of the sprouting crabgrass seeds, and it should not harm the grass already established in the lawn. The best time to give an overall application of a crabgrass preventer is in the spring before the pest can sprout. As this is often the time when it is advisable to give your lawn a good fertilizer, then look for a lawn fertilizer that includes a crabgrass preventer, to do both jobs in one. However, the timing can be critical and the window of opportunity to stop the crabgrass seedling germination is short, maybe only about ten days. The ideal time is when the soil temperature has reached 52F (11C). If the infestation with crabgrass has become very noticeable, then a fast acting weed and grass killer will do the job. Just spray a little on the affected area. Within a couple of days, the area should be clear of crabgrass and ready for reseeding with the lawn grass of your choice. The best solution to having a lawn free of crabgrass is to create an environment where the invader cannot survive. That means having a healthy lawn with robust turf. A thick grass lawn will provide enough shade on the soil surface to stop crabgrass seeds from germinating. To get that many gardeners recommend weekly, or twice weekly heavy watering that forces the grass to build a deep root system. This makes the lawn more heat tolerant and hardy. Daily watering with tends to create a shallower, and a weaker root system. Try not to mow your lawn shorter than two inches, as this reduces the strength of the grass, and allows the weeds to penetrate the lawn. The blades of the mower should be regularly sharpened as the grass needs to be cut not torn. The cut grass can be left on the lawn as a natural fertilizer. If the grass is deprived of oxygen and water due to compacted soil, then weeds will thrive. It is a good idea to run an aerator over the lawn once a year, especially if there is a lot of clay in the soil. When fertilizing, look for brands that offer slow release nitrogen. Excessive use of nitrogen can weaken the grass in your lawn over just a few seasons. Also, reseed any damaged areas to promote growth. This can be done in the fall or spring depending upon the type of grass in your lawn.